Responsible Energy Action is engaging with the Town and County of Antigonish and other major stakeholders to promote active transportation in our area. In 2002, Calgary-based AltaGas began to explore the idea of creating underground storage caverns for natural gas at Brentwood, Nova Scotia. Their plan is to solution-mine two (and up to fourteen) huge salt caverns by extracting water from the Shubenacadie River, piping it 12 km to the cavern site to dissolve underground salt deposits, and returning the resulting salt brine to the River. Natural gas would be stored under pressure in these caverns. Nearby Mi’kmaq communities and non-indigenous residents stress that they have not been properly consulted and have not given consent or social license for this project to proceed. Many people say they found out about the project only when water protectors created slowdowns on a major highway in 2014. Legal challenges and protests in Halifax followed. A Treaty Truck House has been built on the bank of the River, as guaranteed in the Peace and Friendship Treaty of 1752, and this site forms a focal point for protectors to monitor ongoing events at the River. We work with other local groups, the Antigonish Emergency Fuel Fund and the Antigonish Poverty Reduction Coalition to advance more equitable access to energy. Cooperation of the Mayor and town officials have helped to modify some administrative practices of the local electric utility. During our initial phase, 2012-2014, several members of Responsible Energy Action studied and acted on different areas of the issue of hydraulic fracturing. Please see the bottom of this page for links from that period. In 2014, after considering the report of the Nova Scotia Review Panel on Hydraulic Fracturing, the Government of Nova Scotia passed Bill 6 prohibiting high-volume hydraulic fracturing in shale formations, except for research and testing. In early 2018, the Premier of Nova Scotia and the Municipality of the District of Guysborough raised the issue of hydraulic fracturing once again. On March 19th, 2018, Antigonish Town Council unanimously decided to *not* recommend lifting the 2014 ban on hydraulic fracturing in Nova Scotia at this time. We appreciate their judicious approach! This is a modified version of carbon pricing proposed by the Citizens’ Climate Lobby Canada, whereby rising fees would be charged on imported and domestic carbon fuels, then redistributed to individuals as a monthly dividend. See Carbon Fee and Dividend. REA and its members participated in Antigonish Climate Resilience, an informal group from Antigonish Town and County that began meeting in the fall of 2014 to find ways to encourage our community to plan for the local consequences of climate change and to do our part to help slow it down. In 2018 a working group on Fair Climate Transition was begun. REA and its members participate in the ACE co-op. Antigonish Cooperative Energy uses education, advocacy and community based initiatives to make renewable energy more accessible to individuals, families and organizations. REA members produced an info brochure outlining the $34 billion in direct and indirect subsidies in Canada. We also co-operate with students involved in the Divest-X campaign. In Spring 2015 REA launched a Blue Dot campaign in Antigonish. Members provided information on the campaign to schools, Town and County Councils, and area residents. They collected over 800 signatures on a Blue Dot petition. In 2015, both the Municipality of the County of Antigonish and the Town of Antigonish passed Blue Dot declarations affirming residents’ rights to clean air, earth, and water. Also called “flowback fluid” or “produced water,” this is the mixture of water, sand, fracking additives, and in some cases naturally occurring radioactive materials (NORMs) that comes back to the surface during hydraulic fracturing operations. Atlantic Industrial Services (AIS) in Debert has accepted fracking wastewater from both New Brunswick and Nova Scotia. The wastewater was treated and then released into the Chignecto River, which flows into the Minas Basin. It was also learned that wastewater was also sent through the Town of Windsor’s sewage treatment facility, a plant not designed for this purpose. In December 2012, Shoal Point Energy announced to a public meeting that if it proceeds with shale gas development in Western Newfoundland, wastewater could be shipped to Nova Scotia for treatment. On November 4, 2013, Newfoundland and Labrador announced they would not be issuing any new licenses for hydraulic fracturing pending further study and consultation. On December 12,2013, Nova Scotia passed an Importation of Hydraulic Fracturing Wastewater Prohibition Act. 1. 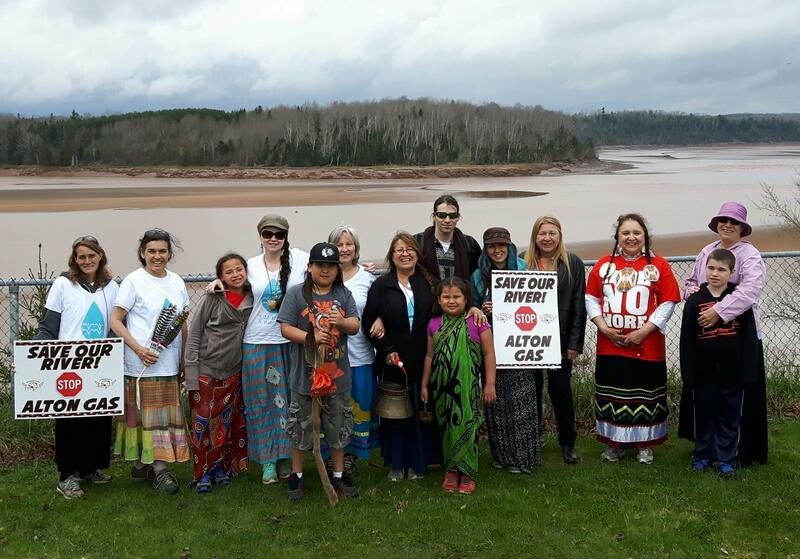 Here’s a backgrounder on Mi’kmaq concerns near Lake Ainslie, the work of Waycobah First Nation activist Trevor Gould, as well as a good list of chemicals used in fracking: Intercontinental Cry. In May, 2013, Inverness County, NS passed a by-law prohibiting hydraulic fracturing. 3. Recommended reading: Two Families: Treaties and Government, by Harold Johnson. Published by Purich Publishing of Saskatoon in 2007, this is an extended and thoughtful essay on the relations between First Nations, governments, and society in general, from the premise that settler folk are cousins adopted by First Nations on the territory we call Canada. We also have a working group focused on engaging with our elected officials and with other community groups. In November, 2013, the Union of Nova Scotia Municipalities passed a resolution to ask the Government of Nova Scotia to enact a province-wide moratorium on fracking. In September, 2014, the province passed legislation banning hydraulic fracturing except for research and testing purposes. Responsible Energy Action is a community group in Antigonish, Nova Scotia concerned with how we obtain and use energy.